Leave it to eagle eyed Chinese drama fans to spot a potential spoiler in a tiny frame in what felt like a cute but throwaway scene in Descendants of the Sun. 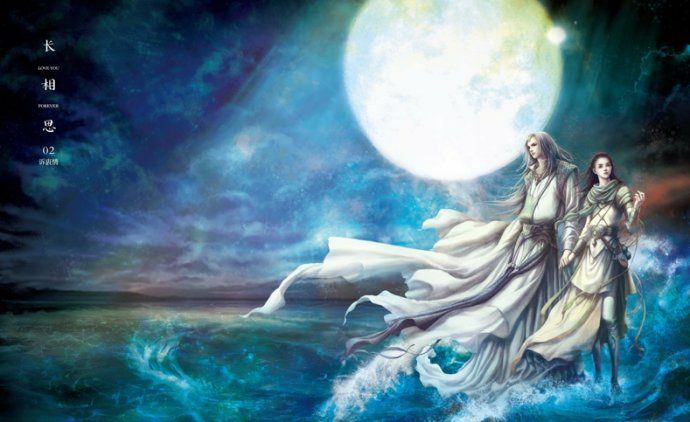 The popularity of this drama in China, and in Korea as well as many other Asian countries, means any little thing makes the news, but a potential hint as to the ending direction is totally worth sharing even if it doesn’t happen. This one is pretty believable, but if there are any doctors reading my bloggie please feel free to weigh in. DotS finished filming at the end of last year is a pre-produced drama with an ending already set, or might be set depending on whether the production chose to film multiple endings just to have the flexibility. 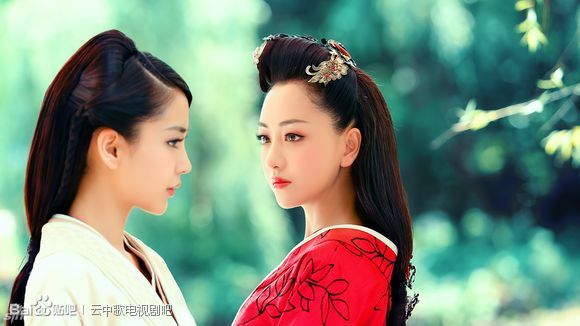 C-dramas doe that a lot to fit into the pre-produced mold but retain the power to pick an ending after gauging audience feedback during the airing. I know what ending would make me happy, and it involves a certain flirty captain getting everything he wants and then some. I’ll save the potential spoiler for after the jump for those not adverse to peeking at hints. 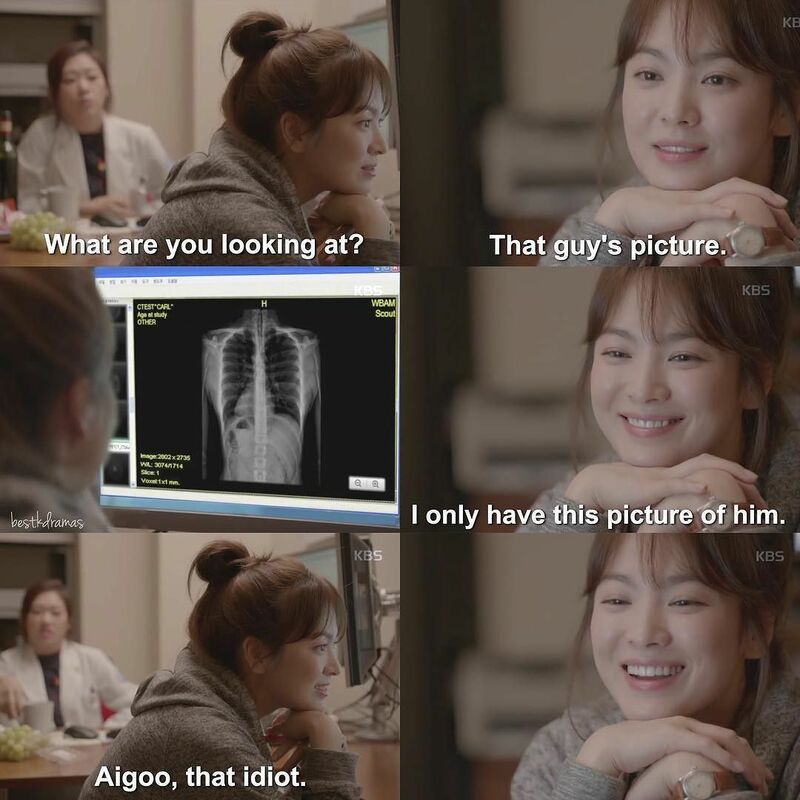 C-viewers are claiming that the scene where Mo Yeon stares moony-eyed at Shi Jin’s chest x-ray contains a huge spoiler – in the x-ray his heart apparently is tilting to the right side of the body in a condition called Dextrocardia, as opposed to the normal tilting to the left. If that’s true then it’s possible that Shi Jin may survive a gunshot wound to the left side of chest that others may see as a critical wound. This spoiler may dovetail with the earlier one that Shi Jin dies, maybe Shi Jin is mortally wounded and ought to die if he were an average person, but with Dextrocardia he miraculously survives and gets his happy ending with Mo Yeon. It’s a good catch from the C-fans and one that would make me happy even if this twist is fairly easy to predict. there’s a scene of him wearing a suit and acting like a bodyguard with a headpiece and gun/car action. my guess is he retires from the world traveling soldier life and becomes a bodyguard instead to stay close to his doctor lady. Can’t they join the NIS instead?They wear suits and Presidential bodyguard detail is much more impressive than private work. he doesn’t just have dextrocardia, he has situs inversus. all his organs are flipped, his liver is on the left rather than the right. Hold on, Mo Yeon is a hot-shot trauma surgeon and she was gazing at the x-ray along with the Pathologist, Dr Pyo and neither of them picked up this rare physical occurrence? Sorry. 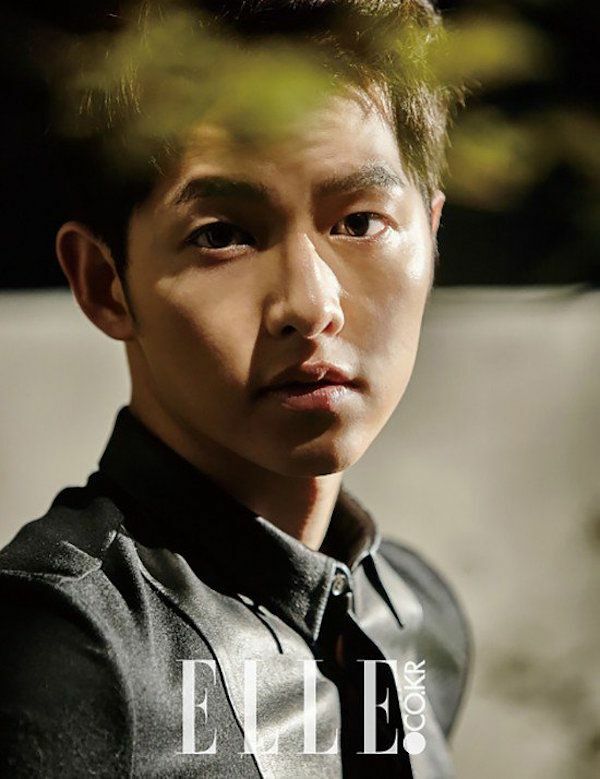 On second thought, anything is possible in Drama Land….so Captain Yoo Si Jin (aka) Mr. Fine just needs to live to make many of us happy. It’s not life threatening so why would she care. she could have made note of it anyway. may be its a rare medical condition that make keeps her staring at the film. There are huge mistakes in every medical TV-series I watched. 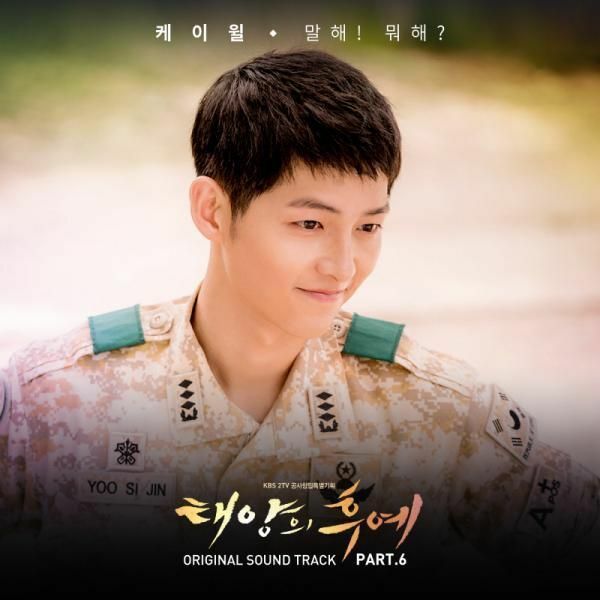 I know doctors in SK have pointed out several mistakes in DoTS. It wouldn’t surprise me if the chest x-ray was just put backwards; in that case, there is no potential ending spoiler whatsoever, only a casual mistake. Sometimes, too much information (as well as knowledge) can kill all the fun! Is this further hinted in the 1st (2nd?) episode when he pretends to have appendicitis in front of Dae Young and Dae Young tells him he’s faking it on the wrong side? No. At that episode he touched the left part (which is true). Dae young tease him that it suppose to be the right part, but at the end he said that the left part is the true one (the one that si jin touched at the first place). I initially thought they’d flipped it too, but when I rewatched ep2 the other day, I realized the labeling was the right way round. As X-rays are mostly electronic nowadays it would require more effort to actually flip it than to keep it so figured it probably was meant to be situs inversus. Thinking about episode 1’s beginning, the North Korean soldier said to YSJ that he had previously been holding it in the other hand. I wonder if this was meant to imply that he was originally left handed as there are postulations -although – although disputed- that situs inversus is associated with left handedness. @Smoky – Same! I wasn’t really bothered the first time I saw it, thinking it was just flipped but on rewatch, the labels are correct so it was upright and properly put up. Wow, interesting. And in this drama, there aren’t alot of throwaways. So this might be brought up soon. Just like the discussion of setting up SJ with flight attendant friends of DY’s cousin in episode 1 in exchange for him not answering MJ’s call at the cafe. Could he also have switched handedness to protect vital organs? Not sure about fighting styles and techniques. Unless the X ray is flipped. Isn’t that more likely considering that it was a short scene and mistakes happen? Unless Situs Inversus is actually going to be part of the plot – like he gets hit in the chest with a bullet/knife on the left side [where his is supposed to be] but tada! Situs Inversus to save the day..
Might also explain the lyrics in You Are My Everything…..a miracle when there could be no more miracles….will have to hope, wait and see. Good catch! Didn’t notice that the abdominal organs were flipped as well! NVM, anterior rib cage and clavicles present lol. Question from a noob: is it possible they jusr put the X ray on the … display….thingies? … the wrong way around completely or would you be able to tell if they had? What a shame this show doesn’t touch on the subject about PTSD after soldiers go to war. It would be great to highlight the topic then hide it under some fancy romance. Ugh…enough with PTSD. You need to (re? )watch D-Day instead. I don’t want to watch a documentary. Sorry not sorry. Sorry, but I wouldn’t want something heavy like that in this drama. Other shows can tackle that subject, but definitely not this one. It would bring the overall mood of the show down a lot. Mo Yeon will be the one who operates him. While operating, she found out a tiny mole inside an it turns out to be a tumor. Miraculously, the operation was successful and he is brought to a ward. His Appa comes to visit.. and when Mo Yeon saw him, she said, “Appa.. what are you doing here?” Yeaah… Mo Yeon and Si Jin turn out to be long lost sister. She ‘s heartbroken knowing that there is no future with this Nice Guy… so she walks souuth That Winter When the Wind Blows… and keeps on walking.. until she spots a house. It’s a Full House, because in the house 200 people. She asks one ofthe residents what the house is called, and he said “It’s SungkyunKwan.” hehehhehhehe…..
Dextrocardia… I see a GSW to the “heart” in this drama’s future. Let’s hope for Mo Yeon’s sake that he doesn’t have Kartagener’s as well! Hi, what is a GSW, please? She can’t be talking gunshot wound right? I am currently on annual leave. All work related thinking left behind. 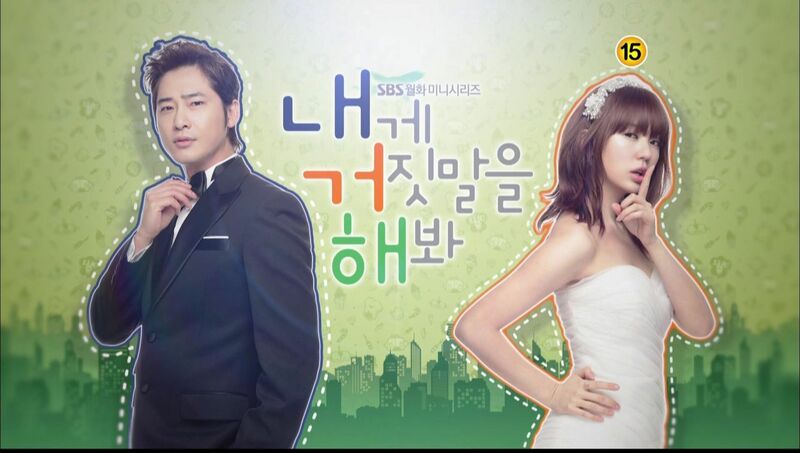 I am going to marathon my dramas. Didn’t even watch last week’s episodes properly. I’m honestly okay with basically anything happening as long as SJ and MY are (1) alive and (2) together at the end of this. Tell me they both fly to Pluto and live on the moon where he continues to be a snarky and beautiful and she operates on aliens – that’s okay with me. If only she operates and saves E.T.’s alien babies. hahaha…Ms. Koala, you’re trying to comfort me even with a gleam of hope for a happy ending. Fine, I’ll buy the theory. Captain Yoo is a rare male human being anyway. But somehow this conjecture based on his X-ray film cracks me up. Actually the Korean press already noticed this awhile back. And it’s so in character for someone like SJ to not die even when he should. I can see how that xray would come back eventually. MY starred at it enough she’d realize she could save him. it’s either a mirror image or he has situs invertus, either way he has a normal life span. The problem is the while he may be uniquely different, she’s not. 1) Mo Yeon gets mortally wounded? 2) Shi Jin gets hurt and needs an op, but the surgeon does not know that his organs are inverted. This can be dangerous too, cos vital organs are not where they are supposed to be. but this drama tends to adore to bring back things full circle so who knows! My observation is that Captain SJ can write with both right and left hand. He wrote with his left hand on the injured young worker’s arm with a Sharpie while they were both trapped under the ruins (ep 5 or 6?). Ms. Koala, it’s me again begging for ep 11 recap. It’s the first time I’m so pissed off, so mad at Dr. MY’s ignorance. 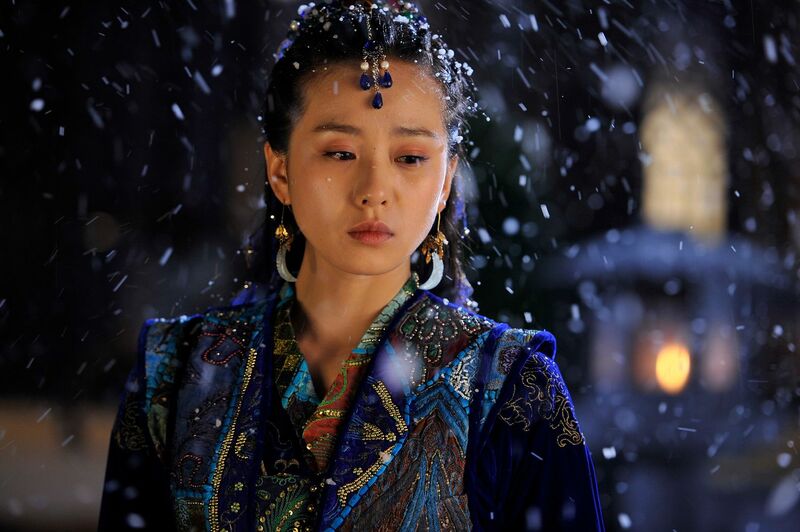 Her inexperience with local gangs and corruption of a war-torn government has become such a liability to Si Jin. How the heck did she end up in the hands of Asparagus? She’s be smart and sensible all the way through this drama until now. Hell! I need a place to vent as soon as possible. How do you expect her to expect that she would be kidnapped because Argus wanted SJ to set him free at night?Is she a liability to SJ? Or vice-versa?